LUFKIN – After an internship at Fossil Rim Wildlife Center in Glen Rose and an eight-year stint at the Dallas Zoo, Lufkin resident Ashley Orr now spends her days working as a zookeeper at the Ellen Trout Zoo in Lufkin. In the Sunday, March 11 edition of The Messenger, we took a look at some of the animals Orr has worked with over the years, including rhinos at the Fossil Rim Wildlife Center. At Ellen Trout, Orr is responsible for caring for animals such as birds and small primates. According to Orr, the zoo recently rescued a raccoon, which is currently in quarantine. The raccoon will also undergo injection training. Ellen Trout Zoo in Lufkin recently rescued a raccoon, who is currently in quarantine. She will eventually be assigned a new habitat in zookeeper Ashley Orr’s section of the zoo and undergo training. Photo by Sarah Naron /Messenger. Successful injection training, Orr explained, requires a great deal of trust between the animal and its keeper. Once the animal exhibits the desired behavior, he or she is provided with a treat to reinforce it. As trust is built through training exercises, the keeper moves from using sticks to using a syringe to better prepare the animal for the experience of an injection. The animal is rewarded once again, instilling the idea that “the syringe means good things. Following the use of the paperclip is that of a blunt needle before the animal is exposed to a sharper needle. Orr also pointed out the planned location of the zoo’s future gorilla exhibit, which will likely encompass roughly an acre of the property. The zoo is also considering a “mixed species” exhibit, in which other primates such as mangabeys are housed with the gorillas. The exhibit is one which Orr is eagerly awaiting. “There’s just so much you can do with gorillas,” she said. “When I left Dallas, I was participating in cardiac ultrasound training for the boys. Male gorillas – just like male people – tend to suffer from heart disease more than their female counterparts. In addition to training, one of the main responsibilities of a zookeeper is preparing meals for the animals. As Orr pointed out in the midst of preparing a meal for the family of tawny frogmouths who reside at the zoo, providing exactly what an animal would hunt for and consume in the wild is not always a possibility. Many of the animals for which Orr is responsible receive meals composed of specific amounts of fruits, vegetables and specially formulated biscuits. 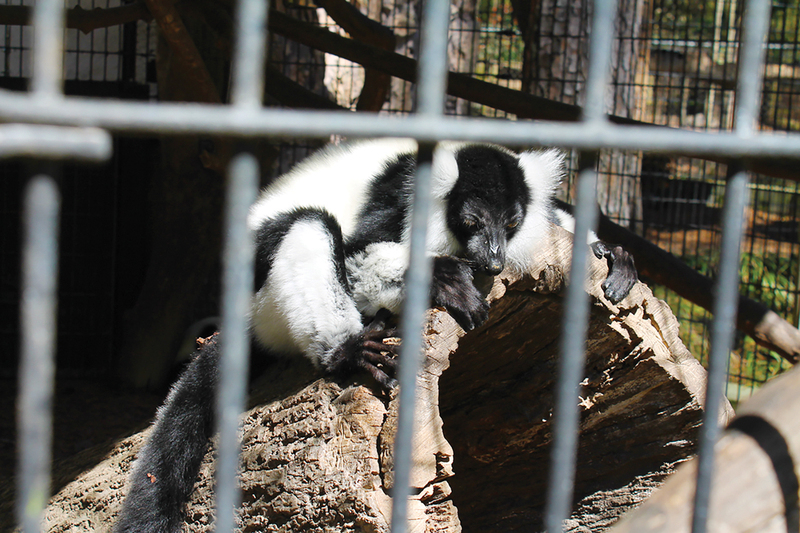 Orr explained that some animals, such as lemurs, can be particularly picky concerning how their food is presented. For Orr, choosing which animal is her favorite is challenging. “I like them all – some for the same reasons, but many of them for different reasons,” she explained. “Rhinos were my first love, and it’s hard to say that they won’t always be where my heart is. It’s hard to replace that once you’ve felt it. From a training perspective, gorillas have been the animal which Orr has most enjoyed. Orr also explained the distinction between a favorite species and favorite individual animal commonly formed by zookeepers. “There are definitely individuals in each species I’ve worked with where it’s like, ‘Well, ibex are fine, but that particular ibex is the bomb. I love that guy,’” she chuckled. Another challenge of being a keeper discussed by Orr is relocating to cities which may be far away from family and friends. As she explained, however, coworkers typically bond as a close-knit group. “You go through everything together,” she pointed out. “Those are the people – if something goes wrong – that you’re counting on to have your back. It’s a really unique work environment in that regard. Really, you have to be there for each other. At the end of each day, despite its challenges, the job of being a zookeeper is one Orr thoroughly enjoys. “My favorite part about this job is that it is so dynamic,” she said. “It’s always different every day. The animals present new challenges and new joys, and I get to do a little bit of everything. According to Orr, the job is also one which provides a great sense of purpose. “I feel like I get to make a difference,” she said.